Car Insurance and Deer Accidents – Am I Covered? This is an excerpt from the article “Car Insurance and Deer Accidents”. For more information, please visit www.about.com for more info. Am I covered? 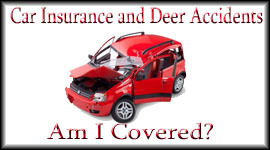 Deer accidents are covered under the comprehensive coverage of your insurance policy. If you are unsure of your coverage, locate your declarations page to verify. A quick phone call to your agent or customer service representative can also clarify what coverage you have listed on your vehicle. Sometimes after a deer accident, a tow may be required. If you have comprehensive coverage, the tow will automatically be covered as part of the claim. If you do not have comprehensive coverage, but have roadside assistance, your tow will be covered. No comprehensive coverage plus no roadside assistance, means you will be on your own for both the damage of your vehicle and the tow. Car Insurance and Deer Accidents – Will It Affect My Insurance Rate? This is an excerpt from the article “Car Insurance and Deer Accidents.” For more info, please visit www. about.com. Will it affect my insurance rate? Unfortunately, a definite answer across the board of insurance carriers is not available. Insurance companies have varying rules on comprehensive claims. Many times, comprehensive claims do not affect your insurance rate, but it is something you will have to verify with your carrier. Deer accidents are frequent in many areas of the U.S. Knowing how to react when you see a deer can minimize your injuries and insurance bills. Know what your coverage is before a claim arises. Understanding how much your deductibles are and when they apply will prevent a lot of hassle. Speak with your agent or customer service representative if you have any questions about your coverage. The following is an excerpt taken from the article, “Car Insurance and Deer Accidents” For more information please visit carinsurance.about.com. The number of lawsuits The number of deer related accidents spike every fall. Deer auto accident statistics are staggering. Deer have a mind of their own and react unexpectedly. The only thing you can control is your own reaction to seeing a deer in your path. Prepare yourself for a potential deer accident and learn the answers to common questions regarding your insurance. Should I swerve to avoid hitting a deer? No! Never swerve to miss hitting a deer. A lot more damage and injury is at stake if you swerve to attempt avoiding impact with a deer. Once you swerve, you are at a much greater risk of hitting oncoming traffic, a tree, light post, mailbox, or ditch. The damage from hitting a deer is often minimal in comparison to hitting one of these other objects. Injury is also a lot more probable when you swerve to miss a deer. The consequences for swerving to miss a deer can be significant in regards to your insurance policy too. Hitting an inanimate object with your vehicle is a collision. Collision accidents often come with higher deductibles and higher surcharges. Swerving to miss a deer is a natural reaction. It takes focus to consider all the repercussions of swerving. A deer can cause major damage to your vehicle and cause injury, but the potential is much greater if you plow into a tree. Take your foot off the gas and keep a straight course to reduce damage and higher insurance rates. Do I have a deductible? Comprehensive coverage is often purchased with a deductible. Some companies do offer a zero deductible, so it depends on how you set your policy up. Comprehensive is less expensive than collision and is often sold with a lower deductible. 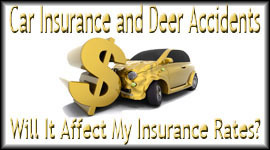 If you have a deductible listed on comprehensive, it will definitely apply to a deer auto accident. Check your declarations page or call your agent to verify what your deductible is listed at. Do I need a police report? Police reports are handy with any insurance claim; however, usually they are not required for a comprehensive claim to be paid out. It is recommended to get a police report especially if you have hit multiple deer recently. Documentation makes the claim process cut and dry. If you are able to get a report filed with the police department, get it done. GDL is a novice driver licensing system that is proven effective at reducing teen drivers’ high crash risk by 20-40%. States with stronger, comprehensive GDL systems see a higher reduction in teen crashes. GDL reduces teen driver exposure to high crash risk situations, such as nighttime driving and teen passengers. This allows new drivers to build experience and skills in lower-risk conditions. The National Safety Council is a leader in promoting Graduated Driver Licensing [visit to review and download helpful pdf: nsc.org] (GDL). There are many car seat choices on the market. Use the information below to help you choose a car seat that best meets your child�s needs. Your child under age 1 should always ride in a rear-facing car seat. There are different types of rear-facing car seats: Infant-only seats can only be used rear-facing. Convertible and 3-in-1 car seats typically have higher height and weight limits for the rear-facing position, allowing you to keep your child rear-facing for a longer period of time. Keep your child rear-facing as long as possible. It�s the best way to keep him or her safe. Your child should remain in a rear-facing car seat until he or she reaches the top height or weight limit allowed by your car seat�s manufacturer. Once your child outgrows the rear-facing car seat, your child is ready to travel in a forward-facing car seat with a harness. Keep your child in a forward-facing car seat with a harness until he or she reaches the top height or weight limit allowed by your car seat�s manufacturer. Once your child outgrows the forward-facing car seat with a harness, it�s time to travel in a booster seat, but still in the back seat. Keep your child in a booster seat until he or she is big enough to fit in a seat belt properly. For a seat belt to fit properly the lap belt must lie snugly across the upper thighs, not the stomach. The shoulder belt should lie snug across the shoulder and chest and not cross the neck or face. Remember: your child should still ride in the back seat because it�s safer there. • Vehicle repossessed: Notice from lien holder and plate return receipt, C-19 form or new registration. • Vehicle junked: Receipt from junk yard and plate return receipt, C-19 form or new registration. • Moved out of state: Date of move and registration from new state.